My mom is a special breed of grandma. A special breed of woman, really. 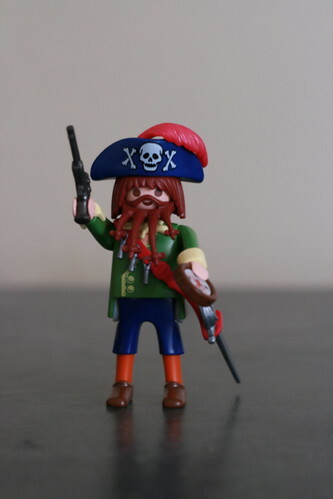 She brought Madeline a Playmobil pirate set when she came to visit last week (because those little guys are Madeline's absolute favorite toys), and the following EDUCATIONAL MOMENT ensued. It shoots a big heavy ball that blasts into the sides of other ships to sink them. Me: A different kind of weapon. Madeline: Does it sink ships too? Grandma, in a misguided attempt to change the subject: OH LOOK!!! This guy has a peg-leg! Grandma: His leg is made of wood. Grandma: Umm...because it got cut off. Grandma: Uh, that's a skull. Me: OH MY GOSH, MOM. I should not be surprised. My mom once accidentally taught some neighborhood children the term "two-fisted drinker" in an attempt to be extra-supportive of their lemonade stand.